I finally had inspiration, and after something like two years of sitting around managed to come up with a satisfactory script for Emitare! (wooo~) Aesthetically, it's based off of the Chinese Seal Script (which is frickin awesome looking). Not really sure if it counts as an abugida or what, since there's no 'default vowel', but it's not a syllabary since each letter is decomposable. Holes in the table indicate phonologically impossible combinations. ti/tji and di/dji occupy two columns, since they're romanised <tji dji> and pronounced /ci J\i/, but spelled in Emitare as t-i and d-i. Haven't quite decided on diphthongs yet, but I'm leaning towards the Japanese way of just using a separate vowel character after the consonant (i.e. lai is la-i) since there's really no more room for more lines in some of those letters. Full-height letters are typically used wherever space constraints require horizontal writing, and half-height wherever space requires vertical writing. Normal text (i.e. in books and stuff) is vertical. Mismatches are unusual - half-height horizontal is rare, and full-height vertical is almost entirely nonexistent. I hope to add a punctuation system soon, once I come up with something that doesn't look exactly like Japanese. EDIT: I just realised I wrote 'rouded' on that sheet. Plh. Hurray for you! And thanks very much for posting it. Aesthetically, it's based off of the Chinese Seal Script (which is frickin awesome looking). There's a system to how the symbols (or "jamo") for individual sounds are made. They aren't arbitrary, but, rather, some sub-symbols represent certain distinctive features of phonemes (e.g. voicedness, roundedness, palatalization). So it's like a featurography. But the full graphemes each represent a syllable; they're syllable blocks. So it's like a syllabary. 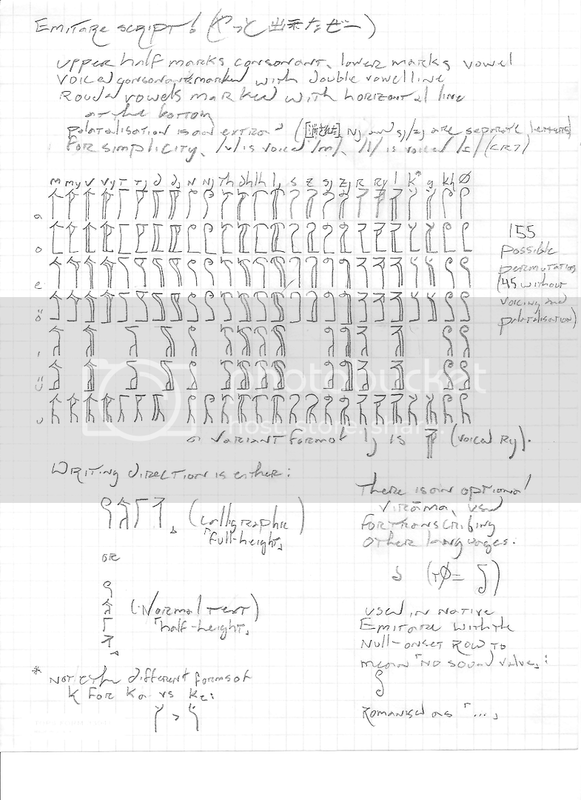 I think the variation for horizontal writing vs vertical writing is both logical and cool. I'd like it explained more clearly, though. I, at least, am pleased and impressed. (Not to mention grateful). That will be interesting to see. Is "plh" an acronym, and if so, for what? Or is it just the exasperated sound of someone who's mildly disgusted with a mistake they've made but don't have the energy to correct? No problem ^_^ The board's been depressingly quiet of late. Didn't think about Korean, the parallel works pretty well. The one difference is that Korean jamo are considered separate entities and aren't graphically connected, while the Emitare letter parts are graphically connected and aren't considered separate entities. It's mostly the same concept, though. Perhaps a new term is in order - 'composite script'? Can't think of anything more Latinate ATM. What would you like clarification on? I don't have ideas for the actual forms yet, but I know the basics of how the system will work - it's based off of intonation patterns, rather than anything directly semantic (unlike canonical Roman punctuation, but very much like how I interpret Roman punctuation). So there's a symbol for 'rising tone at the end of a sentence, as if a question', rather than 'a question'; or 'flat tone as if a factual statement' rather than 'a statement' (so writing 'What.' is entirely acceptable and encouraged). It's the second one - onomatopoeic, pronounced as /pK/. As Serali would say, "pretty scripty"
Punctuation has always been my biggest pain in a script. Full stops and commas are likely to have simple signs due to their constant use, so I can forgive myself using a dot, a small line, a cross etc, but when it comes to question marks, parentheses, quotation marks and so on... I'm just lost. My problem exactly. Especially figuring out how to fit them in with the aesthetics of the rest of the script. The double dots are commas. The bit at the end is a kind of calligraphist's signature (even though it's terrible calligraphy), written in a very stylised script version. It reads 'Sjiveru'. I also realise now that I missed syllables beginning in y. Öü. ...I'm liking the aesthetics of the script, but it looks really sci-fi-y. Maybe most conscripts look sci-fi-y, due to the proliferation of conscripts within sci-fi. Hm. I don't think it looks that sci-fi-y, not for me anyway. Makes me think more of enscriptions in stone or something along those lines, so I guess it's all relative. I don't think it looks "sci-fi-y". 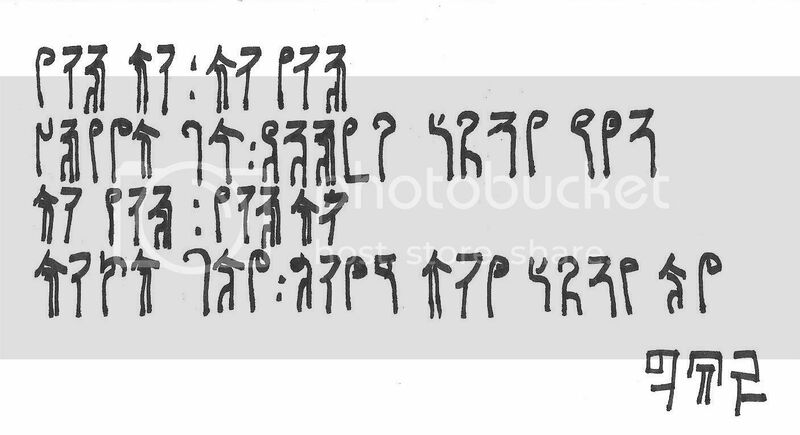 More like one of the "first scripts", for instance the original Phoenician script that so many European and Northern African scripts are descended from. @eldin: If it looks ancient (which is by no means a bad thing, it's actually a bit of a boon - it allows development of form over time), do you have any suggestions for making it look more modern? I might try adding serifs or something, though I still haven't quite decided on the primary writing material. It probably "looks ancient" mostly because of what you wrote it with and on. To make it "look (more) modern" try to make it look like it's printed with movable type. You might start with wood-carved type, but I think cast-metal type is more modern. You might also try to see if you could make a monotype typewriter version, say, your script's analog of Courier. Somewhat less modern; try a cursive form. That'd look at least pre-typewriter, if not pre-Gutenberg. An earlier intermediate form could be inspired by all those Carolingian and other medieval "hands". You wrote with a magic-marker or a Sharpie or a felt-tipped pen, didn't you? Try with a ball-point, see if that's different. Try also with a cartridge pen. And/or a quill pen. Or a fountain pen. Try carving it into a piece of grainy wood with a knife. I'd suggest trying to chisel it into marble or granite or other stone, but you might think I was being ridiculous. So, instead, try using a metal-tipped pen of any sort (or, maybe, a quill pen) -- fountain pen, cartridge pen, (maybe ball-point?) -- and writing on a leaf; a palm leaf or a banana leaf or some other biggish (say 4" by 6" or bigger) if you can find one. Again, I'd suggest trying to write it with, say, a lead pencil on, say, stretched parchment or cowhide or something, but, again, you might think I was being ridiculous. I don't remember when unfortunately. -_- And pretty pretty scripty. 예쁜 스크립티! ᄏᄏᄏ 퓌티 스크립티! Ohhhh~ 한글 is FUN to mess with! The boingies are proud and request more samples. @Eldin: I think you're right about the pen making the difference. Not exactly sure how to make it look like movable type - I certainly can't make physical type myself, and I'm not sure I have the skills to approximate the look in the GIMP or something (I'm pathetic with graphics programs). @Serali: Thank you! I will definitely post more samples. Done! This is why I don't have "Internet Security" because they're full of it. Looking forward seeing more samples. 싵......you know what this is supposed to be yes? Thank you very much! This will thankfully cease to be a problem once I head off to college in three weeks. Avoiding censors by writing words in Hangeul - nice. Censors are a pain. I can understand if children are using the internet but we're not children so why you have them is beyond me. Just make sure your parents never hear you saying those words. I'm a completely different case. In other words I'm a bad bad child. But that's not my fault........kids are mean. P.S I went shopping today and they had a new store of sorts with "좋은 하루 되세요" in those flashing animated signs I thought I was seeing things. I was like WTF last time I checked I didn't move/live in Korea Town (plan to visit again though). Epic win! According to that book by Father Edward Catich (sp?) called something like "The Origin of the Serif," the flourish you make at the end of each stroke (of a chisel-tipped paintbrush, in the case of the Roman inscriptions we get our letters from) to avoid that big blob is exactly how you get a serif. I never knew that! Thank you!